Last The One flanker I’m going to do in a while. Rose The One is a member of Dolce & Gabbana’s The One line. This time there’s an obvious relationship to the rose note. In Bottle: Rather bit of citrus to open it up. The pink grapefruit is rather detectable, almost all I smell with a sweet lingering modern rose in the background. Rose The One is sweet and clean, with a nice use of pink grapefruit up front. Applied: Clean pink grapefruit opening the fragrance with a slight tartness borrowed from the black currant. The rose note in this fragrance comes up rather quickly in the opening but isn’t very strong and doesn’t do much to overpower the grapefruit. Don’t get me wrong, I love the grapefruit but for a fragrance that tries to capitalize on rose, I would have expected the rose to be stronger. Still, the rose note hangs out rather admirably and I catch whiffs of it along the way. The fragrance settles into the mid-stage with a nice modern rose and lily interpretation with lingering bites of pink grapefruit. I smell sweet peony intermingled with the floral-dominant mid-stage too as warmness washes over the mid-stage and helps to ease that grapefruit out of the way. The dry down is what you would expect of a fragrance ending with the sandalwood and vanilla duo. Extra: Rose The One had a fantastic little ad campaign featuring Scarlett Johansson in a rose-dominant commercial. The entire campaign was very soft and obviously trying to capitalize on the modern rose note that’s the namesake for this fragrance. Design: Once again, Rose The One is designed similarly to other The One bottles with a squat classic shape. Rose The One hammers home that it’s a romantic rose note based thing by being a lovely shade of pink. There’s rose gold as the cap. A rosy pink liquid. Even the lettering is in a deep rosy color. It’s all very lovely and very feminine. Notes: Black currant, pink grapefruit, mandarin, lily of the valley, rose, litchi, peony, Madonna lily, ambrette seed, sandalwood, musk, vanilla. I’m going to keep going with L’eau as my favorite iteration of The One for now. Rose The One is pleasant enough but at times it’s a strange battle between the grapefruit opener and the floral mid-stage. Reviewed in This Post: Rose The One, 2010, Eau de Parfum. 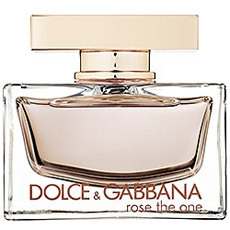 This entry was posted in dolce and gabbana, floral, Reviews By House and tagged ambrette seed, black currant, lily of the valley, litchi, Madonna lily, mandarin, musk, peony, pink grapefruit, rose, sandalwood, vanilla. Bookmark the permalink.